Phuket is Thailand’s largest island and the gateway to some of its most beautiful beaches and isles. This group tour is ideal for travelers on a budget, taking in all the highlights, including the beach resorts of Patong, Kata, Karon, and Rawai; the Three-Beach Viewpoint; and Wat Chalong Temple. Your tour begins with pickup from your Phuket hotel by air-conditioned coach. Start with a drive through Phuket Town, admiring the colorful colonial buildings, as your guide offers some background information about the island’s history and heritage. Loop around the south coast of the island, stopping at the beach resorts of Patong, Kata, Rawai, and Karon, where you’ll have a chance to stroll along the white-sand beaches and visit the Three-Beach Viewpoint to take photos of Phuket’s stunning coastline. Finally, pay a visit to the beautiful Wat Chalong Temple, the largest and most renowned of Phuket’s many temples. At the end of your tour, you’ll be dropped back at your hotel. Thank you very much for your valuable review, it can be useful to other guests. Second time in Phuket we recommend island day trip as there are many nice islands around. You will enjoy it. 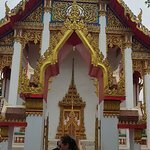 This was a great tour to get a overview of Phuket and the area. 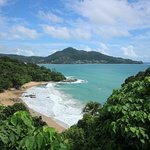 The tour is only of the south of Phuket with 2 or 3 stops to admire the scenery. The tourists guide are very great. Much appreciated your valuable comments and thank you for choosing our service. Even though we went on a rainy day and experienced quite a lot of traffic while trying to get into Phuket city centre, it was still a good time going round the other sites of the island. Get quick answers from Phuket Introduction City Sightseeing Tour staff and past visitors. Every Tour group accepts singles, you will be made very welcome if you are friendly with the others & you can still do what you want not what they tell you to do. BE ADVENTUREST. Must there really be 2 persons to get a booking? Im travelling alone and i want to go. I went on my own couldn’t use the Viator site. I can’t remember which booking agent allowed me to book on my own (but I was the only person there on my own!). It was still heaps of fun.